The illustration is also from Dobie. The Arms of Cunningham of Glencairn are:- Argent, A shakefork Sable. Alexander Cunningham of Glencairn was a kinsman of Glengarnock and a notable author of Reformation boks and a personal friend of John Knox. He was a powerful and stabilising influence in the West of Scotland in particular. Inside the church, on the south wall is a replica of the inscription on the Crawfurd Mausoleum. This panel was inserted in 1929 when the decision was taken not to re-carve the original, for to do so would have destroyed its authenticity. 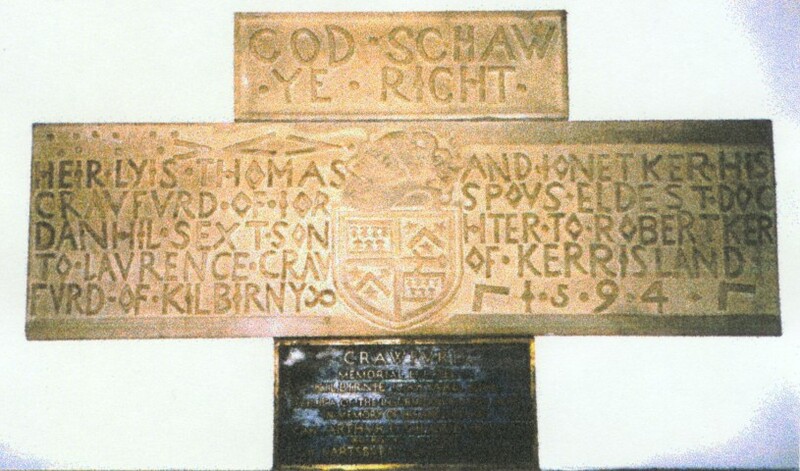 The stone was commissioned by a descendant of Thomas, Captain Arthur Crawfurd of Cartsburn, Greenock. A chance discovery recently by the Lyon Clerk established that Janet Ker of Kersland, the second wife of Thomas Crawfurd was a Heraldic heiress, since her father had predeceased her without male heirs to inherit the arms. The Clerk’s careful statement is "these appear to be the Arms used by Thomas Crawfurd and his wife Janet Ker of Kersland. The chevron is certainly a much more common Ker charge, especially in association with the stars although they normally appear on the chevron rather than either side of it". The Blazon would appear to be: 1st and 4th Gules a fess Ermine (for Crawfurd); 2nd and 3rd Gules a chevron Argent between three mullets of the second (for Ker of Kersland); over all in fess a sword proper. See End Notes for more information.